Hardman Chemicals P/L, Australia – “Our EVERDURE CALTITE Joint-free acid proof floor is now 19 years old in constant use – which compares extremely well with the life of our ordinary (concrete) earliest floors.that were destroyed in less than 9 months each. Brisbane City Council, Australia – “Both samples suffered from sulphide attack, but the sample containing CALTITE and PLASTET No. 2 suffered much less attack than did the ordinary 20Mpa concrete”. BRITISH BOARD OF AGRÉMENT (BBA) (*Ask your Cementaid representative for a copy of the certificate) – “The Caltite System has no detrimental effects on the properties of the cured concrete. ..Site observations and other data show that the properties of concrete containing Everdure Caltite have been maintained for up to 30 years. “Site observations and other data show that the properties of concrete containing EVERDURE CALTITE have been maintained for up to 30 years.”The effects of the Caltite System ingredients are permanent. Independent testing on Caltite concretes after up to 20 years field exposure to severe chloride and sulphate environments, has proven no reduction of these outstanding properties, or the quality of Caltite concrete and embedded reinforcing, at all. After less than two years, all of the ordinary concrete chairs suffered severe sulphate attack. Additional chairs were cast in 1962 using exactly the same mix, but incorporating Everdure Caltite @ 30 Lts / m3, as well as steel reinforcement. After 18 years in service, the reinforced Caltite concrete has remained in excellent condition, with no re-bar corrosion, and only minor surface etching. The Caltite concrete remains in service today, corrosion-free after 37 years. This is in contrast to the non-Caltite chairs, which were severely damaged within only 4 years, and near to collapse after 20 years, as shown to the right. 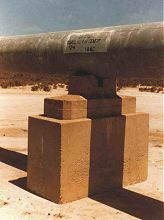 These were placed in the inter-tidal zone in 1968 to restrict public access, and are subject to daily tidal immersion cycles in the highly saline water of the Gulf. In normal concretes, elevated drying temperatures such as those here greatly increase rates of salt penetration and of re-bar corrosion. 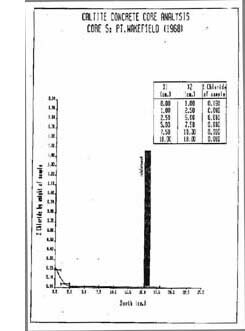 In 1985, after 17 years wet / dry cycling, cored samples were tested by drilling and measuring actual chloride penetration at varying depths. Compared to the surface level (0 – 10mm), chloride penetration in the 10 – 25mm zone was reduced by 84%. Chloride reduction beyond the 10 – 25mm zone was 100%. “Cores taken from Caltite System concrete exposed to tidal immersion for up to 17 years showed no signs of corrosion of the embedded reinforcing and little surface erosion. The capillarity of field “Caltite” concrete with an average cement content was lower than low w / c ratio lab concretes containing over 450 Kg/m3 of cement and superplasticisers. The water repellency of “Caltite” concrete was found to be unaffected by tidal immersion over a period of up to 17 years”. This project demonstrates long term evidence confirming that the high electrical resistivity of Caltite concrete provides an additional preventative protection against chloride attack. This is the case even where chlorides are present at the level of reinforcement prior to final set (e.g. 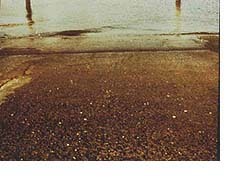 beach sand, contaminated aggregates, etc. ), such as in this project. In 1965, the City of Glenelg (South Australia) re-constructed a corrosion-damaged boat launching ramp, this time using Everdure Caltite concrete for the lower, seaward section, to prevent chloride attack. The Caltite concrete used a 25 MPa mix with an Ordinary Portland cement content of approx. 280 Kg / m3. The upper portion (photo foreground) used exactly the same mix, only without Caltite. Caltite section remains in good condition. 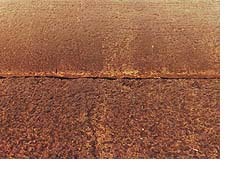 After 20 years, the section without Caltite shows evidence of severe chloride attack, with large cracks and patched areas over reinforcement lines (left of photo), as well as 8 – 10mm surface loss from salt scaling, so that the larger aggregates are clearly exposed. By contrast, the Caltite concrete section has remained in very good condition, with no evidence of re-bar corrosion attack, and insignificant surface wear. Being at the seaward end of the ramp, the Caltite section is subject to a shorter inter-tidal drying period. At the construction joint however, drying exposure conditions are equivalent, and a valid comparison of performance is provided. 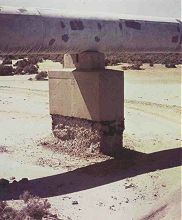 The adjacent photo (1985) shows the construction joint between the Caltite (top) and plain concrete (bottom), after 20 years exposure. The Caltite concrete has remained in excellent condition, and it is still possible to see the “broom-marks” made at the time of finishing, to provide traction. On the other hand, severe surface loss, aggregate exposure, and evidence of corrosion-induced cracking, is clearly visible in the plain concrete. 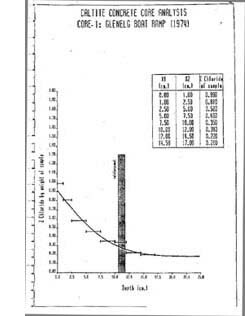 Chloride analysis of the Caltite concrete section in 1985 by Taywood Engineering confirmed no corrosion of steel reinforcement, despite inclusion in the Caltite mix of a calcium chloride accelerator at the time of casting, to prevent wash-out by the incoming tide. This resulted in a very high “background” level of chlorides, being present within the concrete from the day of casting. This background level was approximately 4 times higher than that required for activation of steel, yet no corrosion had occurred, despite 20 years tidal exposure. 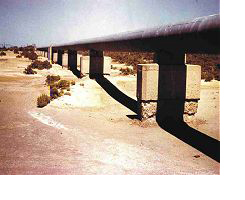 The absence of corrosion is primarily due to the low moisture content and very high electrical resistivity of the Caltite concrete. The chloride profile in this instance shows an ingress “curve”. Unusual for Caltite concrete, (see Pt. 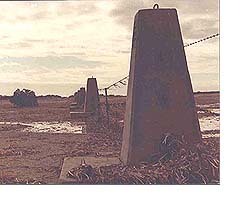 Wakefield Artillery Markers, above), this is believed to be due to the presence of a crack in the slab at the coring location, (which had subsequently self-healed), and the fact that the Caltite concrete was “cured” in sea-water. The Caltite ramp remained in service and in similarly good condition until middle of 1999, when the structure was de-commissioned, and the area subsequently re-developed. The Caltite ramp achieved the Clients’ requirement for a corrosion-free and maintenance-free service life of their marine exposed structure, being in this instance 34 years. This included daily wetting and drying under hot, salty and windy conditions, at least one known crack, and the presence of a very high level of admixed chlorides at the level of reinforcement since the day of casting.